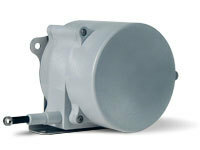 The SR1E is rugged, low-cost, high performance string pot built to withstand wet environments and outdoor applications. Designed for construction equipment and factory use, the SR1E is the perfect low-cost solution for OEM and stocking distributors. At the heart of this sensor is a robust incremental encoder that delivers a linear resolution of 101 pulses per inch. The SR1E ships with an industry standard push-pull encoder driver that can be powered by 5-30 VDC. (Other resolutions and complimentary channels are available, please consult factory). Each sensor ships with a 4-pin, field installable, M12 connector and an additional 13 ft. (4 m) cord set is also avail- able. Just like the rest of our SR1 series, the SR1E is in stock for quick delivery.